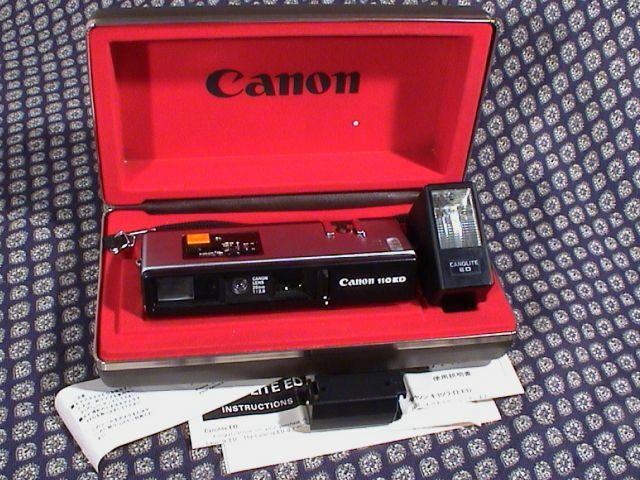 The 110E was Canon's introduction to 110 photography designed for ASA 100 film. It has a 26mm (f2.7-f16) four elements in four groups focusing lens, electronic shutter from 8 seconds to 1/500th and an aperture-priority CdS meter. The camera has a hot shoe, tripod and a cable release socket next to the shutter release. It requires a single PX28 battery. 133 x 55.5 x 28.5 mm (5 1/4 x 2 3/16 x 1 1/8"), 240g (8.5oz). The 110ED is an improved version of the 110E and was launched in 1975. 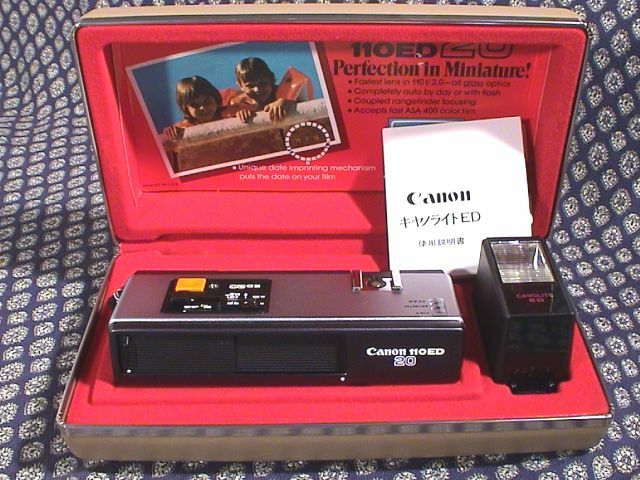 Like the 110E it has a built-in hot shoe but supplied optionally with a special ED flash that provided auto-exposure flash control. The film speed was fixed at 80 ASA. The lens is a fast 26mm f2.0, 5 elements in 4 groups, rangefinder-coupled with aperture f2, f4, f8, f16 and shutter speeds of 8 seconds - 1/1000 which 1/125 for flash. Focusing from 2 feet to infinity by a slide with scale in metres, feet and symbols with parallax correction in the viewfinder. The camera has a sliding protection cover, tripod socket and a cable release sockets next to the shutter release. Date imprinting function with the year wheel set between 1977 and 19861 and the single digits 0 to 9. Uses a single Mallory PX28 battery. Accessories include Canon Releases 30, 50, Selftimer 8, Canon Speedlite Extender. Released in 1979 the 110ED20 correctly exposes 80 and 400 speed film, same 26mm (f2.0, f4, f8, f16) rangefinder-coupled lens as the 110ED. Focusing 2 feet to infinity. Electronic shutter with speeds of 8 seconds - 1/1000 plus flash sync at 1/125. Focusing from 2 feet to infinity by a slide with scale in metres, feet and symbols; proper distances between 0.8 and 5 metres. Viewfinder has parallax correction and under-/over-exposure warning lamps. The camera has tripod socket and a cable release sockets next to the shutter release. Date imprinting function with the year wheel set between 1978 and 19882 and the single digits 0 to 9. Uses one A544 (PX28L) battery or four LR44 batteries. Accessories include Canon Releases 30, 50, Selftimer 8, Canon Speedlite Extender, Close up lens 110. 142.2 x 55.5 x 28.8 mm (5 9/16 x 2 3/16 x 1 1/8"), 340g (12 oz). 1. Early versions had a date range 1974-1984.